Rocket Crane Service was established in 1945 and is a family owned operation serving the entire state of Minnesota and Western Wisconsin. We specialize in the construction industry, HVAC industry, tree removal, machinery moving, and trucking industry. Our number one goal is to provide the best service possible with the highest quality and safety. We provide you with professionals at all levels, whether it be our Certified Operators, forklift operators, truck drivers, rigging personnel, or office staff. All of our equipment goes through yearly certification by professional 3rd party engineers. 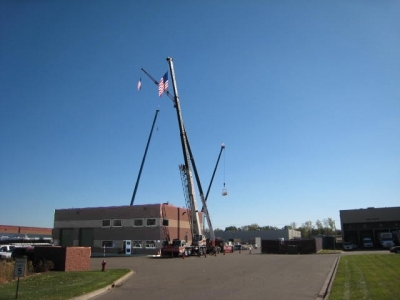 Whether you have HVAC equipment to be replaced or new equipment to put on roofs, you can trust Rocket Crane to find the safest, most cost effective way to handle it. If you have a tree that needs to be taken down, Rocket Crane has been doing tree removal for many years with the Arborists of the Twin Cities area. You can count on Rocket Crane Service to provide you with everything you need to get the job done in a safe, timely and cost effective manner.